I’ve been fly fishing since I was 12 and have been guiding in southern Utah for the last few years. My wife will tell you I’m a certified trout bum. As such, I’ve fished a lot of different lines and different brands. The first time I noticed what a BIG difference a quality fly line can make in fly fishing was when I picked up a Scientific Anglers Mastery Series fly line on clearance for a five weight rod. Since then, I’ve been a big fan of Scientific Anglers. They’ve always performed great and held up nicely. So, when SA introduced the Sharkskin fly line, I decided to try it out. I got the line in a 6 weight GPX taper and spooled it up. It was a nice line. It cast well and mended easily. It was noisy, but nothing I couldn’t get used to. But, my six weight rod is used for streamer fishing and stillwater fishing. In both cases, I’m stripping a lot of line and fighting big fish. The texture of the sharkskin fly line ripped my fingers up and there were times I was bleeding like a madman. Not cool. It was bad enough that I just stopped using my six weight rod for a while! Thus, I found myself in need of a new fly line. I have never heard anything bad about Airflo fly lines. Ever. They were also the first to introduce textured fly lines, an idea I think is genius. So they have my respect. I started hearing through the grapevine that Airflo’s new Super Dri fly lines were the bomb. They introduced a few different models. The first is the Airflo Super Dri Xceed, designed for fast action rods. The second is the Airflo Super Dri Elite. This is a classic trout taper. The third is the Airflo Super Dri Mend. This line is for turning over heavy stuff, like big flies and indicators. The fourth is Airflo Super Dri Distance Pro. This line is a trout taper but longer, designed for long distance casts and mending. The fifth line in the Airflo Super Dri lineup is the River and Stream. This one is your all around performance fly line, suited for technical water. These new Airflo Super Dri fly lines piqued my interest, since I’m a huge believer in investing in top notch, quality products that will stand up to abuse and last more than one season. And, I needed a different six weight line. Then Jace, fellow co-owner of Current Seams Fly Fishing, bought the Airflo Super Dri Xceed fly line. He was raving about it after one outing. It made his Winston fly rod seem twice as nice. So I was hooked. I jumped online and purchased an Airflo Super Dri Xceed fly line for my neglected six weight. I’ve been fishing the Ariflo Super Dri Xceed for two years. I’ve thrown a lot of dries with it, and I feel this is the ultimate test in fly line testing. To fish dry flies successfully, a line that floats, shoots well, and mends easily is critical for drag free drifts and presentations. This fly line is textured. It has ridges running the length of the line, so there is less surface friction and resistance. But, unlike other textured lines, this one isn’t noisy and doesn’t rip up your fingers. You can’t tell it’s a textured line. It’s great. Also, this line isn’t made with PVC, like all other fly lines are. It’s made with polyurethane, and Tim Rajeff wholeheartedly believes this is a better material for fly lines. Tim Rajeff is a world fly casting champion and owner of Rajeff Sports and rod designer for Echo Fly Rods. The dude knows his stuff. His shop Rajeff Sports is the North American dealer for Airflo (Airflo is based in the UK). So, while I don’t know enough about PVC vs. Polyurethane, I’m going to trust Tim on this one. Airflo also engineered this line with Hydrophobic materials. Hydrophobic means “water repelling”, or “does not mix with water.” This term jumped out at me too because I’m a fan of powder dry fly floatant for soaked dry flies that are sinking. The powder in dry fly floatants is called Hydrophobic fumed silica. So some of the same stuff that dries out your drowned dry flies is incorporated into the Airflo fly lines to repel water. And the results are apparent. The Super Dri Xceed line feels super slick and mends like a dream. And after a long drift, I can shoot every inch of excess fly line piled up at my feet with one cast. This is easily 40 feet of fly line for me. It’s phenomenal. There is one drawback to this fly line that I have noticed. In cold temperatures, it retains a lot of memory. This means the line coils up and doesn’t straighten out very easily. This can be an issue when the line is piled at your feet and is a coiled mess. I’ve found by peeling a lot of line off the reel and pulling it straight between my hands helps. With warmer temperatures though, the line does much better. The line doesn’t stretch, which I tested by tugging on it. It was a very scientific test, I know, but it didn’t give at all. The line also incorporates Airflo’s ZONE technology. The fly line is two different colors. The belly of the line, which spends most of it’s time shooting through the guides, is a more subdued olive or moss color. It’s not as supple as the head of the fly line, which allows it to shoot better through the guides. This line has been impressive so far and I’d strongly encourage you to give it some serious thought. 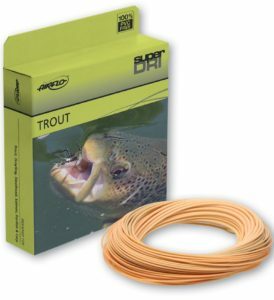 Airflo Super Dri Xceed Fly Line. The Xceed only comes in one color, called Pumpkin.